Silver is a metal used in a myriad of applications, many that the average person would not realize. Amonst its many uses is as the major component in Sterling Silver, at a ratio of 92.5% of the total makeup. Sterling Silver is used in making many types of products primarily Jewellery and Silverware. In both cases the use of pure or virgin silver is not practical as the metal is too soft for durability. It is in the jewellery product lines that the word Silver can often be used in the context of 'Silver Jewellery' as well as 'Sterling Silver Jewellery' however the two terms are not synonyms as Sterling Silver needs to meet a standard fineness of a minimum of 92.5% silver content whilst mauch jewellery marketed as silver jewellery is in fact simply silver plated and hence has a very miniscule content of actual silver. So the word 'Silver' needs to be understood and used in its correct context particularly when it is alloyed with other metals as is the case for many products. Silver is a chemical element with symbol Ag (Greek: άργυρος árguros, Latin: argentum, both from the Indo-European root *arg- for "grey" or "shining") and atomic number 47. A soft, white, lustrous transition metal, it possesses the highest electrical conductivity of any element, the highest thermal conductivity of any metal and is the most reflective metal on the planet. The metal occurs naturally in its pure, free form (native silver), as an alloy with gold and other metals, and in minerals such as argentite and chlorargyrite. Most silver is produced as a byproduct of copper, gold, lead, and zinc refining. While silver has long been valued as a precious metal it is also used in currency coins, solar panels, water filtration, jewelry and ornaments, high-value tableware and utensils (hence the term silverware) and as an investment in the forms of coins and bullion. Silver is used industrially in electrical contacts and conductors, in specialized mirrors, window coatings and in catalysis of chemical reactions. Its compounds are used in photographic film and X-rays. Dilute silver nitrate solutions and other silver compounds are used as disinfectants and microbiocides (oligodynamic effect), added to bandages and wound-dressings, catheters and other medical instruments. Silver is a very ductile, malleable (slightly harder than gold), univalent coinage metal, with a brilliant white metallic luster that can take a high degree of polish. It is the most reflective metal on Earth. It has the highest electrical conductivity of all metals, even higher than copper, but its greater cost has prevented it from being widely used in place of copper for electrical purposes. An exception to this is in radio-frequency engineering, particularly at VHF and higher frequencies, where silver plating to improve electrical conductivity of parts, including wires, is widely employed. During World War II in the US, 13,540 tons were used in the electromagnets used for enriching uranium, mainly because of the wartime shortage of copper. 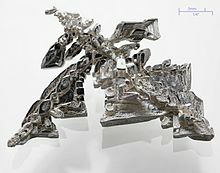 Among metals, pure silver has the highest thermal conductivity (the nonmetal carbon in the form of diamond and superfluid helium II are higher) and the highest optical reflectivity (protected silver has higher reflectance than aluminium at all wavelengths longer than ~450 nm; below 450 nm, silver is inferior to aluminium and its reflectance drops to zero near 310 nm). Silver is the best conductor of heat and electricity of any metal in the periodic table. Silver also has the lowest contact resistance of any metal. Silver halides are photosensitive and are remarkable for their ability to record a latent image that can later be developed chemically. Silver is stable in pure air and water, but tarnishes when it is exposed to air or water containing ozone or hydrogen sulfide, the latter forming a black layer of silver sulfide which can be cleaned off with dilute hydrochloric acid. The most common oxidation state of silver is +1 (for example, silver nitrate, AgNO3); the less common +2 compounds (for example, silver(II) fluoride, AgF2), and the even less common +3 (for example, potassium tetrafluoroargentate(III), KAgF4) and even +4 compounds (for example, potassium hexafluoroargentate(IV), K2AgF6) are also known. Naturally occurring silver is composed of two stable isotopes, 107Ag and 109Ag, with 107Ag being slightly more abundant (51.839% natural abundance). Silver's isotopes are almost equal in abundance, something which is rare in the periodic table. Silver's atomic weight is 107.8682(2) g/mol. Twenty-eight radioisotopes have been characterized, the most stable being 105Ag with a half-life of 41.29 days, 111Ag with a half-life of 7.45 days, and 112Ag with a half-life of 3.13 hours. This element has numerous meta states, the most stable being 108mAg (t1/2 = 418 years), 110mAg (t1/2 = 249.79 days) and 106mAg (t1/2 = 8.28 days). All of the remaining radioactive isotopes have half-lives of less than an hour, and the majority of these have half-lives of less than three minutes. The palladium isotope 107Pd decays by beta emission to 107Ag with a half-life of 6.5 million years. Iron meteorites are the only objects with a high-enough palladium-to-silver ratio to yield measurable variations in 107Ag abundance. Radiogenic 107Ag was first discovered in the Santa Clara meteorite in 1978. The discoverers suggest the coalescence and differentiation of iron-cored small planets may have occurred 10 million years after a nucleosynthetic event. 107Pd–107Ag correlations observed in bodies that have clearly been melted since the accretion of the solar system must reflect the presence of unstable nuclides in the early solar system. 2S also forms silver whiskers when silver electrical contacts are used in an atmosphere rich in hydrogen sulfide. Silver chloride (AgCl) is precipitated from solutions of silver nitrate in the presence of chloride ions, and the other silver halides used in the manufacture of photographic emulsions are made in the same way, using bromide or iodide salts. Silver chloride is used in glass electrodes for pH testing and potentiometric measurement, and as a transparent cement for glass. Silver iodide has been used in attempts to seed clouds to produce rain. Silver halides are highly insoluble in aqueous solutions and are used in gravimetric analytical methods. 3), and silver acetylide, formed when silver reacts with acetylene gas. 3) which is used as a photographic fixer, to remove excess silver halide from photographic emulsions after image development. 7), and in the presence of potassium bromide (KBr); these compounds are used in photography to bleach silver images, converting them to silver halides that can either be fixed with thiosulfate or redeveloped to intensify the original image. Silver forms cyanide complexes (silver cyanide) that are soluble in water in the presence of an excess of cyanide ions. Silver cyanide solutions are used in electroplating of silver. 3, produced by the reaction of elemental silver or silver fluoride with krypton difluoride. Silver artifacts primarily under go three forms of deterioration. Silver sulfide is the most common form of silver degradation. Fresh silver chloride is pale yellow colored, becoming purplish on exposure to light and projects slightly from the surface of the artifact or coin. The precipitation of copper in ancient silver can be used to date artifacts. Many well-known uses of silver involve its precious metal properties, including currency, decorative items, and mirrors. The contrast between its bright white color and other media makes it very useful to the visual arts. By contrast, fine silver particles form the dense black in photographs and in silverpoint drawings. It has also long been used to confer high monetary value as objects (such as silver coins and investment bars) or make objects symbolic of high social or political rank. Silver salts have been used since the Middle Ages to produce a yellow or orange colors to stained glass, and more complex decorative color reactions can be produced by incorporating silver metal in blown, kilnformed or torchworked glass. Silver, in the form of electrum (a gold–silver alloy), was coined to produce money around 700 BC by the Lydians. Later, silver was refined and coined in its pure form. Many nations used silver as the basic unit of monetary value. In the modern world, silver bullion has the ISO currency code XAG. The name of the pound sterling (£) reflects the fact it originally represented the value of one pound Tower weight of sterling silver; other historical currencies, such as the French livre, have similar etymologies. During the 19th century, the bimetallism that prevailed in most countries was undermined by the discovery of large deposits of silver in the Americas; fearing a sharp decrease in the value of silver and thus the currency, most states switched to a gold standard by 1900. In some languages, such as Sanskrit, Spanish, French, and Hebrew, the same word means both silver and money. The 20th century saw a gradual movement to fiat currency, with most of the world monetary system losing its link to precious metals after Richard Nixon took the United States dollar off the gold standard in 1971; the last currency backed by gold was the Swiss franc, which became a pure fiat currency on 1 May 2000. During this same period, silver gradually ceased to be used in circulating coins. In 1964, the United States stopped minting their silver dime and quarter. They minted their last circulating silver coin in 1970 in its 40% half-dollar. In 1968, Canada minted their last circulating silver coins which were the 50% dime and the 50% quarter. The Royal Canadian Mint still makes many collectible silver coins with various dollar denominations. In addition to Canada, the United States and many other countries continue to mint silver coins that are collected for their bullion and numismatic value. The U.S. coin is known as the "Silver Eagle". Silver is used as a currency by many individuals, and is legal tender in the US state of Utah. Silver coins and bullion are also used as an investment to guard against inflation and devaluation. Shallow silver bowl, Persian, 6th century BC (Achaemenid). The deeper depressions reperesent lotus buds, an Egyptian motif. Walters Art Museum collections. Jewelry and silverware are traditionally made from sterling silver (standard silver), an alloy of 92.5% silver with 7.5% copper. In the US, only an alloy consisting of at least 90.0% fine silver can be marketed as "silver" (thus frequently stamped 900). Sterling silver (stamped 925) is harder than pure silver, and has a lower melting point (893 °C) than either pure silver or pure copper. Britannia silver is an alternative, hallmark-quality standard containing 95.8% silver, often used to make silver tableware and wrought plate. With the addition of germanium, the patented modified alloy Argentium Sterling silver is formed, with improved properties, including resistance to firescale. Sterling silver jewelry is often plated with a thin coat of .999 fine silver to give the item a shiny finish. This process is called "flashing". Silver jewelry can also be plated with rhodium (for a bright, shiny look) or gold (to produce silver gilt). Silver is a constituent of almost all colored carat gold alloys and carat gold solders, giving the alloys paler color and greater hardness. White 9 carat gold contains 62.5% silver and 37.5% gold, while 22 carat gold contains a minimum of 91.7% gold and 8.3% silver or copper or other metals. Historically, the training and guild organization of goldsmiths included silversmiths, as well, and the two crafts remain largely overlapping. Unlike blacksmiths, silversmiths do not shape the metal while it is red-hot, but instead, work it at room temperature with gentle and carefully placed hammer blows. The essence of silversmithing is to take a flat piece of metal and to transform it into a useful object using different hammers, stakes and other simple tools. While silversmiths specialize in, and principally work silver, they also work with other metals, such as gold, copper, steel, and brass. They make jewelry, silverware, armor, vases, and other artistic items. Because silver is such a malleable metal, silversmiths have a large range of choices with how they prefer to work the metal. Historically, silversmiths are mostly referred to as goldsmiths, which was usually the same guild. In the western Canadian silversmith tradition, guilds do not exist; however, mentoring through colleagues becomes a method of professional learning within a community of craftspeople. Traditionally, silversmiths mostly made "silverware" (cutlery, tableware, bowls, candlesticks and such). Only in more recent times has silversmithing become mainly work in jewelry, as much less solid silver tableware is now handmade. About 20g of silver is used in every crystalline solar photovoltaic panel made. Silver is also used in plasmonic solar cells. 100 million ounces of silver are projected for use by solar energy in 2015. Silver is the reflective coating of choice for concentrated solar power reflectors. In 2009, scientists at the National Renewable Energy Laboratory (NREL) and SkyFuel teamed to develop large curved sheets of metal that have the potential to be 30% less expensive than today's best collectors of concentrated solar power by replacing glass-based models with a silver polymer sheet that has the same performance as the heavy glass mirrors, but at much lower cost and weight. It also is much easier to deploy and install. The glossy film uses several layers of polymers, with an inner layer of pure silver. Silver is used in water purifiers. It prevents bacteria and algae from building up in filters. The catalytic action of silver, in concert with oxygen, sanitizes water and eliminates the need for chlorine. Silver ions are also added to water purification systems in hospitals, community water systems, pools and spas, displacing chlorine. Silver can be alloyed with mercury at room temperature to make amalgams that are widely used for dental fillings. To make dental amalgam, a mixture of powdered silver and other metals such as tin and gold is mixed with mercury to make a stiff paste that can be adapted to the shape of a cavity. The dental amalgam achieves initial hardness within minutes, and sets hard in a few hours. The use of silver in photography, in the form of silver nitrate and silver halides, has rapidly declined due to the lower demand for consumer color film from the advent of digital technology. From the peak global demand for photographic silver in 1999 (267,000,000 troy ounces or 8304.6 metric tonnes) the market had contracted almost 70% by 2013. In World War II, there was a shortage of copper and silver borrowed from the United States Treasury for electrical windings for several production facilities including those of the Manhattan Project; see below under History, WWII. Mirrors in almost all reflective telescopes use vacuum aluminum coatings. However thermal or infrared telescopes use silver coated mirrors because of silver's ability to reflect some types of infrared radiation more effectively than aluminum, as well as silver's ability to reduce the amount of radiation actually emitted from the mirror (its thermal emissivity). Silver, in protected or enhanced coatings, is seen as the next generation metal coating for reflective telescope mirrors. Using a process called sputtering, silver, along with other optically transparent layers, is applied to glass, creating low emissivity coatings used in high-performance insulated glazing. The amount of silver used per window is small because the silver layer is only 10–15 nanometers thick. However, the amount of silver-coated glass worldwide is hundreds of millions of square meters per year, leading to silver consumption on the order of 10 cubic meters or 100 metric tons/year. Silver color seen in architectural glass and tinted windows on vehicles is produced by sputtered chrome, stainless steel or other alloys. Silver-coated polyester sheets, used to retrofit windows, are another popular method for reducing light transmission. This Yanagisawa A9932J alto saxophone has a solid silver bell and neck with a solid phosphor bronze body. The bell, neck, and key-cups are extensively engraved. It was manufactured in 2008. Silver and silver alloys are used in the construction of high-quality musical wind instruments of many types. Flutes, in particular, are commonly constructed of silver alloy or silver plated, both for appearance and for the frictional surface properties of silver. Silver's catalytic properties make it ideal for use as a catalyst in oxidation reactions, for example, the production of formaldehyde from methanol and air by means of silver screens or crystallites containing a minimum 99.95 weight-percent silver. Silver (upon some suitable support) is probably the only catalyst available today to convert ethylene to ethylene oxide (later hydrolyzed to ethylene glycol, used for making polyesters)— an important industrial reaction. It is also used in the Oddy test to detect reduced sulfur compounds and carbonyl sulfides. Because silver readily absorbs free neutrons, it is commonly used to make control rods to regulate the fission chain reaction in pressurized water nuclear reactors, generally in the form of an alloy containing 80% silver, 15% indium, and 5% cadmium. Silver stains are used in biology to increase the contrast and visibility of cells and organelles in microscopy. Camillo Golgi used silver stains to study cells of the nervous system and the Golgi apparatus. Silver stains are used to stain proteins in gel electrophoresis and polyacrylamide gels, either as primary stains or to enhance the visibility and contrast of colloidal gold stain. Different yeasts from Brazilian gold mines, bioaccumulate free and complexed silver ions. A sample of the fungus Aspergillus niger was found growing from gold mining solution; and was found to contain cyano metal complexes; such as gold, silver, copper iron and zinc. The fungus also plays a role in the solubilization of heavy metal sulfides.
) is bioactive and in sufficient concentration readily kills bacteria in vitro. Silver and silver nanoparticles are used as an antimicrobial in a variety of industrial, healthcare and domestic applications. Silver coins and bullion are used for investing. Mints sell a wide variety of silver products for investors and collectors. Various institutions provide safe storage for large physical silver investments, and various types of silver investments can be made on the stock markets, including mining stocks. Silver bullion bars are sold in a wide range of ounces, provided by various mints and mines around the world. Silver coins and bullion bars are generally 99.9% pure, and labeled with ".999". Silver inhibits the growth of bacteria and fungi on clothing, such as socks, so is sometimes added to reduce odors and the risk of bacterial and fungal infections. It is incorporated into clothing or shoes either by integrating silver nanoparticles into the polymer from which yarns are made or by coating yarns with silver. The loss of silver during washing varies between textile technologies, and the resultant effect on the environment is not yet fully known. Silver has been used for thousands of years for ornaments and utensils, trade, and as the basis for many monetary systems. Its value as a precious metal was long considered second only to gold. The word "silver" appears in Anglo-Saxon in various spellings, such as seolfor and siolfor. A similar form is seen throughout the Germanic languages (compare Old High German silabar and silbir). The chemical symbol Ag is from the Latin word for "silver", argentum (compare Greek άργυρος, árgyros), from the Indo-European root *arg-, meaning "white" or "shining". Silver has been known since ancient times. Mentioned in the Book of Genesis, slag heaps found in Asia Minor and on the islands of the Aegean Sea indicate silver was being separated from lead as early as the 4th millennium BC using surface mining. The stability of the Roman currency relied to a high degree on the supply of silver bullion, which Roman miners produced on a scale unparalleled before the discovery of the New World. Reaching a peak production of 200 t per year, an estimated silver stock of 10,000 t circulated in the Roman economy in the middle of the second century AD, five to ten times larger than the combined amount of silver available to medieval Europe and the Caliphate around 800 AD. Financial officials of the Roman Empire worried about the loss of silver to pay for highly demanded silk from Sinica (China). Mines were made in Laureion during 483 BC. In the Gospels, Jesus' disciple Judas Iscariot is infamous for having taken a bribe of 30 coins of silver from religious leaders in Jerusalem to turn Jesus of Nazareth over to soldiers of the High Priest Caiaphas. The Chinese Empire during most of its history primarily used silver as a means of exchange. In the 19th century, the threat to the balance of payments of the United Kingdom from Chinese merchants demanding payment in silver in exchange for tea, silk, and porcelain led to the Opium War because Britain had to find a way to address the imbalance in payments, and they decided to do so by selling opium produced in their colony of British India to China. Islam permits Muslim men to wear silver rings on the little finger of either hand. Muhammad himself wore a silver signet ring. In the Americas, high temperature silver-lead cupellation technology was developed by pre-Inca civilizations as early as AD 60–120. During World War II, the shortage of copper led to the substitution of silver in many industrial applications. The United States government loaned out silver from its massive reserve located in the West Point vaults to a wide range of industrial users. One very important use was for bus bars for new aluminum plants needed to make aircraft. During the war, many electrical connectors and switches were silver plated. Another use was aircraft master rod bearings and other types of bearings. Since silver can replace tin in solder at a lower volume, a large amount of tin was freed up for other uses by substituting government silver. Silver was also used as the reflector in searchlights and other types of lights. Silver was used in nickels during the war to save that metal for use in steel alloys. Silver is found in native form, as an alloy with gold (electrum), and in ores containing sulfur, arsenic, antimony or chlorine. Ores include argentite (Ag2S), chlorargyrite (AgCl) which includes horn silver, and pyrargyrite (Ag3SbS3). The principal sources of silver are the ores of copper, copper-nickel, lead, and lead-zinc obtained from Peru, Bolivia, Mexico, China, Australia, Chile, Poland and Serbia. Peru, Bolivia and Mexico have been mining silver since 1546, and are still major world producers. Top silver-producing mines are Cannington (Australia), Fresnillo (Mexico), San Cristobal (Bolivia), Antamina (Peru), Rudna (Poland), and Penasquito (Mexico). Top near-term mine development projects through 2015 are Pascua Lama (Chile), Navidad (Argentina), Jaunicipio (Mexico), Malku Khota (Bolivia), and Hackett River (Canada). In Central Asia, Tajikistan is known to have some of the largest silver deposits in the world. The metal is primarily produced as a byproduct of electrolytic copper refining, gold, nickel, and zinc refining, and by application of the Parkes process on lead metal obtained from lead ores that contain small amounts of silver. Commercial-grade fine silver is at least 99.9% pure, and purities greater than 99.999% are available. In 2011, Mexico was the top producer of silver (4,500 tonnes or 19% of the world's total), closely followed by Peru (4,000 t) and China (4,000 t). As of 5 August 2014, the price of silver is US$649.28 per kilogram (US$20.1950 per troy ounce). This equates to approximately 1/64 the price of gold. The ratio has varied from 1/15 to 1/100 in the past 100 years. Physical silver bullion prices are higher than the paper prices, with premiums increasing when demand is high and local shortages occur. In 1980, the silver price rose to a peak for modern times of US$49.45 per troy ounce (ozt) due to market manipulation of Nelson Bunker Hunt and Herbert Hunt. Inflation-adjusted to 2012, this is approximately US$138 per troy ounce. Some time after Silver Thursday, the price was back to $10/ozt. From 2001 to 2010, the price moved from $4.37 to $20.19 (average London US$/oz). According to the Silver Institute, silver's recent gains have greatly stemmed from a rise in investor interest and an increase in fabrication demand. In late April 2011, silver reached an all-time high of $49.76/ozt. In earlier times, silver has commanded much higher prices. In the early 15th century, the price of silver is estimated to have surpassed $1,200 per ounce, based on 2011 dollars. The discovery of massive silver deposits in the New World during the succeeding centuries has been stated as a cause for its price to have diminished greatly. The price of silver is important in Judaic law. The lowest fiscal amount a Jewish court, or Beth Din, can convene to adjudicate a case over is a shova pruta (value of a Babylonian pruta coin). This is fixed at .025 grams (0.00088 oz) of pure, unrefined silver, at market price. In a Jewish tradition, still continuing today, on the first birthday of a first-born son, the parents pay the price of five pure-silver coins to a Kohen (priest). Today, the Israel mint fixes the coins at 117 grams (4.1 oz) of silver. The Kohen will often give those silver coins back as a gift for the child to inherit. Silver plays no known natural biological role in humans, and possible health effects of silver are a disputed subject. Silver itself is not toxic to humans, but most silver salts are. In large doses, silver and compounds containing it can be absorbed into the circulatory system and become deposited in various body tissues, leading to argyria, which results in a blue-grayish pigmentation of the skin, eyes, and mucous membranes. Argyria is rare, and although, so far as known, this condition does not otherwise harm a person's health, it is disfiguring and usually permanent. Mild forms of argyria are sometimes mistaken for cyanosis. Overexposure to silver can occur in workers in the metallurgical industry, persons taking silver-containing dietary supplements, patients who have received silver sulfadiazine treatment, and individuals who accidentally or intentionally ingest silver salts. Silver concentrations in whole blood, plasma, serum, or urine may be measured to monitor for safety in exposed workers, to confirm the diagnosis in potential poisoning victims, or to assist in the forensic investigation in a case of fatal overdosage. Silver is used in food coloring; it has the E174 designation and is approved in the European Union. The safety of silver for use in food is disputed. Traditional Indian dishes sometimes include the use of decorative silver foil known as vark, and in various cultures, silver dragée are used to decorate cakes, cookies, and other dessert items. The use of silver as a food additive is not approved in the United States. Magnetic susceptibility of the elements and inorganic compounds in Lide, D. R., ed. (2005). CRC Handbook of Chemistry and Physics (86th ed.). Boca Raton (FL): CRC Press. ISBN 0-8493-0486-5. Alex Austin (2007). The Craft of Silversmithing: Techniques, Projects, Inspiration. Sterling Publishing Company, Inc. p. 43. ISBN 1600591310. Nichols, Kenneth D. (1987). The Road to Trinity. Morrow, New York: Morrow. p. 42. ISBN 0-688-06910-X. "Eastman at Oak Ridge – Dr. Howard Young". Retrieved 6 June 2009. Oman, H. (1992). "Not invented here? Check your history". Aerospace and Electronic Systems Magazine 7 (1): 51–53. doi:10.1109/62.127132. Edwards, H.W. ; Petersen, R.P. ; Petersen (1936). "Reflectivity of evaporated silver films". Phys. Rev. 9 (9): 871. Bibcode:1936PhRv...50..871E. doi:10.1103/PhysRev.50.871. "Silver vs. Aluminum". Gemini Observatory. Retrieved 2014-08-01. Hammond, C. R. (2000). The Elements, in Handbook of Chemistry and Physics 81st edition. CRC press. ISBN 0-8493-0481-4. Riedel, Sebastian; Kaupp, Martin (2009). "The highest oxidation states of the transition metal elements". Coordination Chemistry Reviews 253 (5–6): 606–624. doi:10.1016/j.ccr.2008.07.014. "Atomic Weights of the Elements 2007 (IUPAC)". Retrieved 11 November 2009. "Atomic Weights and Isotopic Compositions for All Elements (NIST)". Retrieved 11 November 2009. "Atomic Weights and Isotopic Compositions for Silver (NIST)". Retrieved 11 November 2009. Kelly, William R.; Wasserburg, G. J. (1978). "Evidence for the existence of 107Pd in the early solar system". Geophysical Research Letters 5 (12): 1079. Bibcode:1978GeoRL...5.1079K. doi:10.1029/GL005i012p01079. Russell, Sara S.; Gounelle, Matthieu; Hutchison, Robert (2001). "Origin of Short-Lived Radionuclides". Philosophical Transactions of the Royal Society A 359 (1787): 1991–2004. Bibcode:2001RSPTA.359.1991R. doi:10.1098/rsta.2001.0893. JSTOR 3066270. Bjelkhagen, Hans I. (1995). Silver-halide recording materials: for holography and their processing. Springer. pp. 156–166. ISBN 3-540-58619-9. Meyer, Rudolf; Köhler, Josef and Homburg, Axel (2007). Explosives. Wiley–VCH. p. 284. ISBN 3-527-31656-6. A. Earnshaw; Norman Greenwood (1997). Chemistry of the Elements (2nd ed.). Elsevier. p. 903. ISBN 9780080501093. "A Riot of Effects; Kilnforming". Bullseyeglass.com. 3 February 2011. Retrieved 22 May 2013. "US Half Dollar Timeline". Metallicoin (United States: metallicoin.com). Retrieved 9 May 2013. "Gold Jewellery Alloys > Utilise Gold. Scientific, industrial and medical applications, products ,suppliers from the World Gold Council". Utilisegold.com. 20 January 2000. Retrieved 5 April 2009. "Chambers Search Chambers". Retrieved 6 June 2009. McRae, Kelly. "Trade Secrets". Western Horseman Magazine. Retrieved 6 June 2009. Allen Sykora (2010). "Rising Solar-Panel Generation Means Increasing Industrial Demand For Silver". Kitco News. Retrieved 2014-07-20. "Silver in Windows and Glass - The Silver Institute". 2014-07-20. Retrieved 2014-07-20. Jaworske, D.A. (1997). "Reflectivity of silver and silver-coated substrates from 25 °C to 800 °C (for solar collectors)". Energy Conversion Engineering Conference, 1997. IECEC-97., Proceedings of the 32nd Intersociety 1: 407. doi:10.1109/IECEC.1997.659223. ISBN 0-7803-4515-0. "A Big Source of Silver Bullion Demand Has Disappeared". BullionVault. Retrieved 2014-07-20. Nikitin, Pavel V.; Lam, Sander and Rao, K. V. S. (2005). "Low Cost Silver Ink RFID Tag Antennas". "2005 IEEE Antennas and Propagation Society International Symposium" 2B. p. 353. doi:10.1109/APS.2005.1552015. ISBN 0-7803-8883-6. Wilson, Ray N. (2004). Reflecting Telescope Optics: Basic design theory and its historical development. Springer. p. 15. ISBN 3-540-40106-7. "Gemini Mirror is First With Silver Lining". Gemini Observatory. Retrieved 2014-07-20. Todd Wilson (2007). Reflecting Telescope Optics I: Basic Design Theory and its Historical Development. Springer Science & Business Media. Retrieved 2014-07-20. Hill, Russ (1999). Coated Glass Applications and Markets. Fairfield, CA: BOC Coating Technology. pp. 1–4. ISBN 0-914289-01-2. Rossing, Thomas D. (1998). The physics of musical instruments. Springer. pp. 728–732. ISBN 0-387-98374-0. Meyers, Arnold (2004). Musical instruments: history, technology, and performance of instruments of western music. Oxford University Press. p. 132. ISBN 0-19-816504-8. Golgi, C. (1873). "Sulla struttura della sostanza grigia del cervello". Gazzetta Medica Italiana (Lombardia) 33: 244–246. Harbhajan Singh. Mycoremediation: Fungal Bioremediation. p. 507. Bouadma, L; Wolff, M; Lucet, JC (August 2012). "Ventilator-associated pneumonia and its prevention". Current opinion in infectious diseases 25 (4): 395–404. doi:10.1097/QCO.0b013e328355a835. PMID 22744316. Maillard, Jean-Yves; Hartemann, Philippe (2012). "Silver as an antimicrobial: Facts and gaps in knowledge". Critical Reviews in Microbiology: 1. doi:10.3109/1040841X.2012.713323. Lansdown, Alan B.G (2010). Silver in Healthcare: Its Antimicrobial Efficacy and Safety in Use. Royal Society of Chemistry. p. 159. ISBN 1-84973-006-7. Duquesne, Sophie et al. (2007). Multifunctional barriers for flexible structure: textile, leather, and paper. p. 26. ISBN 3-540-71917-2. Geranio, L.; Heuberger, M.; Nowack, B. (2009). "The Behavior of Silver Nanotextiles during Washing". Environmental Science & Technology 43 (21): 8113. Bibcode:2009EnST...43.8113G. doi:10.1021/es9018332. Patterson, C. C. (1972). "Silver Stocks and Losses in Ancient and Medieval Times". The Economic History Review 25 (2): 205–235 (216, table 2; 228, table 6). doi:10.1111/j.1468-0289.1972.tb02173.x. de Callataÿ, François (2005). "The Greco-Roman Economy in the Super Long-Run: Lead, Copper, and Shipwrecks". Journal of Roman Archaeology 18: 361–372 (365f.). Amemiya, T. (2007) Economy and Economics of Ancient Greece, Taylor & Francis, p. 7, ISBN 0203799313. White, Matthew (2012) The Great Big Book of Horrible Things, New York: W.W. Norton, pp. 285–286, ISBN 978-0-393-08192-3. AHMAD IBN NAQIB AL-MISRI. Reliance of the Traveller and Tools for the Worshipper. pp. f17. Diana Scarisbrick (2004). Historic Rings: Four Thousand Years Of Craftsmanship. Kodansha International. pp. 283–. ISBN 978-4-7700-2540-1. "Direct evidence of 1,900 years of indigenous silver production in the Lake Titicaca Basin of Southern Peru". Pnas.org. Retrieved 22 May 2013. "Coinflation: 1942–1945 Silver Jefferson Nickel Value". Retrieved 11 March 2013. Asimov, Isaac (1966). Building Blocks of the Universe. Abelard-Schuman. CPM Group (2011). CPM Silver Yearbook. New York, NY: Euromoney Books. p. 68. ISBN 978-0-9826741-4-7. "Preliminary Economic Assessment Technical Report 43-101". South American Silver Corp. Archived from the original on 19 January 2012. "Why Are Kyrgyzstan and Tajikistan So Split on Foreign Mining?". EurasiaNet.org. 7 August 2013. Retrieved 19 August 2013. Will Precious Metal Premiums One Day Trump the Spot Price? – International Business Times. Ibtimes.com (18 May 2012). Retrieved on 28 May 2012. Abolafia, Mitchel Y; Kilduff, Martin (1988). "Enacting Market Crisis: The Social Construction of a Speculative Bubble". Administrative Science Quarterly 33 (2): 177–193. doi:10.2307/2393054. JSTOR 2393054. World Silver Survey 2011. London: The Silver Institute and GFMS Limited. 2011. p. 8. ISSN 1059-6992. 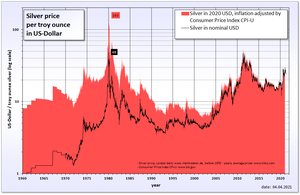 Live Silver Prices, Silver Bullion Prices & 650 Years of Silver Prices at the Wayback Machine (archived March 10, 2010). Goldinfo.net. 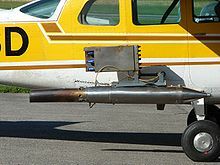 Retrieved on 2 May 2011. Living Judaism: the complete guide to Jewish belief, tradition, Wayne D. Dosick – 1995 "The price was set at five shekalim (the plural of shekel, the monetary unit of the time) for each of the 273 extra firstborn (Numbers 3:47). The money was given to Aaron, the High Priest, the head of the tribe of Levi." Baselt, R. (2008) Disposition of Toxic Drugs and Chemicals in Man, 8th edition, Biomedical Publications, Foster City, CA, pp. 1429–1431, ISBN 0-9626523-7-7. Meisler, Andy (18 December 2005). "A Tempest on a Tea Cart". The Los Angeles Times. Sarvate, Sarita (4 April 2005). "Silver Coating". India Currents. Retrieved 5 July 2009.